I am on a totally new wave length this week. My youngest son started Kindergarten which leaves me for the first time in 8 years kid-free. I have to tell you, I think I may have cried 28 times since pre-school ended… just anticipating this week. I have also realized two things… when left alone, I eat like a college frat boy (this is no lie) and when moms go to Target without children its pure bliss. But, as I sit here on Friday with the worst of it behind me, I will admit that it wasn’t as heartbreaking as I was amping myself up for. We live in a really small town (class sizes are roughly 22 kiddos), teachers email you daily if needed, and the principle is the most kind hearted person that knows everyones name and is very present. So I knew he would be in good hands. Plus being my youngest he really came with me a lot to the school to help out the last 3 years, so my little shy boy has been moving along fairly well. And although I went to lunch nearly every day this week to check on them, had dinner done by 2pm and cleaned my house 7 times… Im doing well too. About mid-week I gave myself a pep talk… I get to work! I get to create! All while being guilt-free that Im not giving them my full attention. So that has been a little freeing. I mailed out orders, and painted not one but TWO pieces this week…in day time hours. The first was a cabinet that I found. It had been well loved and repurposed. The back side has been removed and turned into a small bookshelf, while the front was painted shut. So it does not open…. but my idea for this piece is really for an entry, a cute place to store keys, flowers and maybe a candle. While the backside could hold all the magazines or library books that you want close but not out in the open. I updated the paint and added a new knob. This one is imperfect… as most pieces are… but its a cutie and I like it. Priced at $180 to locals. My second piece was a little more involved.. I needed to be creative this week so I reached for Artissimo by Miss Mustard Seed Milk Paint. I love this color, I have used it several times and each time I am in awe of the pretty blue hue. I bought this piece from my Mother-in-law, it had pretty orange wood and drawers on the inside (which I love to paper). I found a color in my paper stash that matches perfectly. I think my favorite detail is the little piece of wood at the top of the door opening, so of course I had to paper that too. I am taking both pieces to the shop with me tomorrow! I have some really exciting things in the works for this site, my business and what I am planning to offer, so stay tuned for that. I don’t want to give anything away… and some of it might take a few months while the others are going to happen very soon. All in all though… its going to be fun! I feel like I am finally able to get some things started that people have been requesting and I have not had time for until now! P.S. I have my next Furniture Painting 101 coming up on Oct. 1st. This one is extra special as its being held at Pottery Barn of Bellevue. So if you are local to the Seattle/Tacoma area…. this is a wonderful class to take. I bring in vintage chairs that you will paint (and keep! ), all materials (paints, sandpaper, rags, brushes) will all be provided. And I hear that they are providing some special treats. This is not one to miss! Sign up by clicking the “shop” button on the menu above. Summer, Pop-ups and more babies? I feel like I am long overdue for a blog post! Summer with my kids have taken over my every day in such a big way. Just this week we have been to the beach twice, bowling, the zoo, and the park. With my youngest heading to Kindergarten this September, I am trying to spend as much time with them as I can. My heart is so confused on whether I am SO happy to have time to focus on my business and taking care of myself without interruption for the first time in 8 years!….or if I am utterly heartbroken that my years of being a true “stay at home”, that does laundry standing up while eating left over Mac and Cheese are over?? I had a brief moment last week that I woke up in the middle of the night thinking of how I might want another baby, just so that these years can linger a little longer. The next day I was brought back to reality that 2 large dogs, a cat and two very active kiddos are plenty. So my season will come to an end and I plan to bid farewell gracefully. And by gracefully I mean I will eat Cheetos in my car and cry a little on the first day of the school. So, with that being said… I hope that I can blog more about my upcoming projects and plans. I have never had a true schedule to work before, so I am really excited to paint during the day and even hone in on my online store, offering more and growing this side of the business a little bit. Also getting my hands in a few outside projects including more design work, maybe some day time paint classes, possibly an extension to my candle line AND some upcoming Pottery Barn Pop-ups. Which leads me to what I really wanted to share today! Last week I had my first Pop-Up shop held at Pottery Barn Bellevue (WA). I am not one to do shows but I have fallen in love with this “Pop-up” idea. I was originally contacted by them about a month or two ago about my interest in doing one. Ideas immediately started following of a mini collection. I wanted to incorporate my painted pieces and candle line but I also wanted to bring a few home accents. I found a gorgeous paper print on Spoonflower.com by the talented Elizabeth Ivie of The Little Ivie Cloth Co. called Sprigs and Blooms and based my whole collection off of that. I used black, soft pinks, sage/mint, and dark green. Perfect for Summer. I really wanted to keep the painted pieces to a minimum for a few reasons… although I wanted to showcase some examples of my work (with my main focus always on furniture) I also knew that if would be tough to load in and equally tough for people to impulse buy and walk to their cars. I stuck with 5 small furniture pieces and accented my display with hand-stamped pillows, vases/glassware, F+F matches, Tea-light bar, handmade keychains + wristlets, NEW candle gift sets and of course loads of my regular candle line. So excited for what is in store! I hope you are enjoying your Summer so far! Flash Sale on Candle Orders Today Only! I thought it would be a fun day to do a Flash Sale. With Spring coming up in the next few weeks, it marks the year anniversary of the best selling scents… Clementine, Lemon Verbena and Honey Sea Salt. Click “shop” on the above bar and make sure to use code : 15OFF to receive a special 15% off today only. My love for The Real Milk Paint Co. 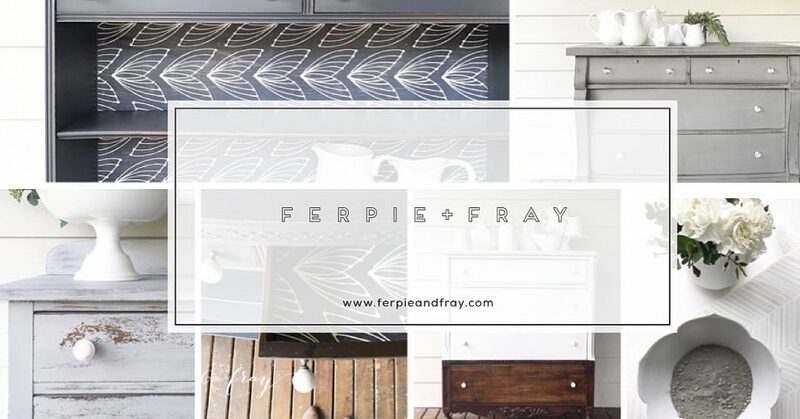 I am so excited to share some details of a few products that The Real Milk Paint Co. sent me! First I have to say… I just love them. Their partnership has been beyond what I ever imagined. I was first contacted maybe two years ago and offered a sponsorship for one of my Milk Paint 101 classes. It was such a generous offer. I think its really valuable especially in a class of that nature to have a ton of product to play with. I teach my classes from my perspective, things I have learned, tools I find valuable. Its important for me to share a process that I feel saves me time, money AND patience. I stress the importance of trying a lot of product and making mistakes. Milk Paint takes time to learn and master, and is still a process unlike any other paint. Making those mistakes will make you a better painter and artist. This time around The Real Milk Paint Co. had some new products that they are rolling out and I got a chance to test them. This kick started a inspiration surge last week like no other. Which was a good thing, it being the week of Black Friday and Small Business Saturday I had a store to fill (and still do!). They sent me a number of colors..some old favorites that are my staple colors and some NEW ones I had never tried (along with Hemp Oil, Chippy Paste, 3 different waxes, t-shirts, bags, brushes, etc.) . They have a great line of new Blue Tipped brushes that paint like a dream and come in 3 sizes. I love the small detail one. I used it the most on a buffet I did and it minimized the brush strokes beautifully. If you are not familiar with their paint packaging, it comes with the bag of powdered paint inside, and a small marble. You add equal parts water (start with just a 1/3 of the bag), seal and shake well. It creates a really nice thick foam. This is my favorite part! The brushes bristles are close together and thick, so the foam rests on top of the brush which makes the application flawless. Another great product that is new is a “Chippy Paste”, we played with this in class and it seems to do a great job a repealing the paint in the areas that you have applied… for those of you that love chippy furniture, this is a great way to obtain that look. I encourage you to play with this and let me know what you think! I plan to try it on a larger piece to get the full effect. Finally one product that I am SUPER excited to talk about is their new Soft Wax… I am willing to admit that I am very picky about wax. Especially over Milk Paint! I look for a few things… it needs to go on smoothly with a rag (a simple process, like applying lotion), I like to gauge how much of the color it will change (some wax can drastically change the original color), and finally a CLEAR finish… a lot of wax can create a white or foggy haze over that pretty color and change your finish. I have to say this wax blew me away. I love it. I think I may have over shared my love for it in my class. I was sent a full can, and used it on 4 large pieces… I still have half a can but I will be bugging them soon to buy more to add it to my stash of favorite products. Well done RMPC! The first is in Stillwater Cove Grey sealed with their NEW Soft Wax. This is painted in Earth Green and sealed in their NEW Soft Wax. And this one is Arabian Night, I sealed this one in a dark brown wax. ( I like to do this over all my black painted pieces… it deepens the hue of the wood and paint for a more seamless finish). A huge THANK YOU to The Real Milk Paint Co.for your continued support and generous sponsorship. This class was so fun and each person left with 2 cans of paint, brushes and other goodies! *All content in this post is my true opinion and I was not compensated to share my thoughts. I just really love it and know you will too! Enjoy!